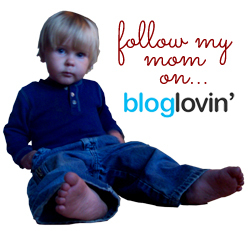 Progeny Press is one of my very favorite companies for teaching literature to my children. 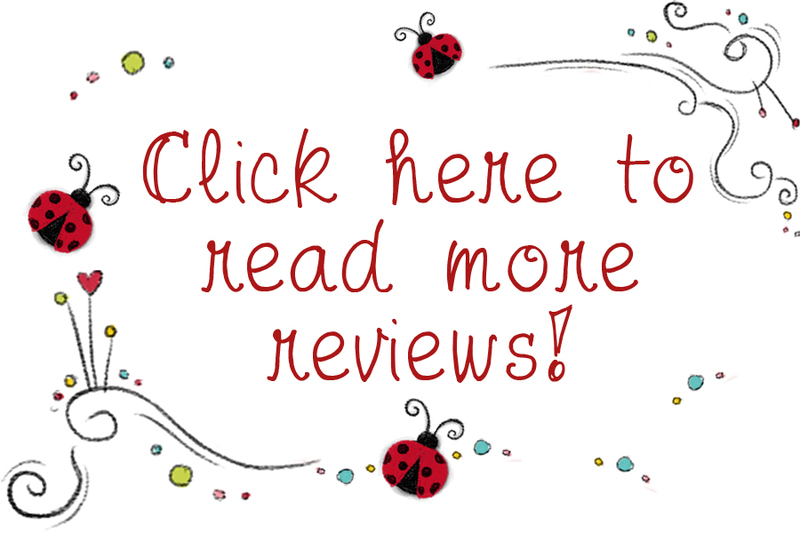 We were blessed to be able to review their Little House in the Big Woods study last year, and I was thrilled when I saw that they were on the “upcoming vendors” list with the Schoolhouse Review Crew again. 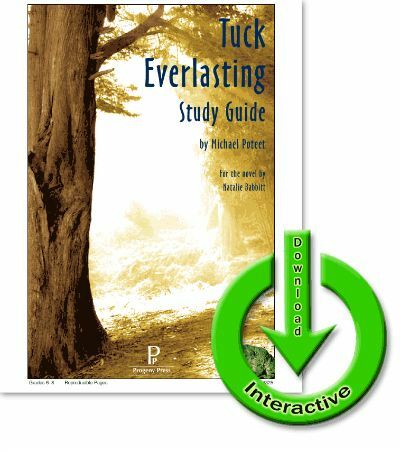 This year, we had the privilege of reviewing their Tuck Everlasting study guide, and I was just as pleased with this one as I was with last year’s. The Tuck Everlasting guide is written with middle schoolers in mind, even though the book itself is a lower level. This means there were some differences between it and the Little House guide we used last year (namely that there weren’t any “fun” activities), but the general setup is the same. I received an electronic version of this study guide. This means that I was emailed a link from which I was able to download the guide to my computer. There are also options for a CD version of the guide (digital and CD versions are both $18.99) or you can request a printed workbook for an additional $3 over the price of the guide itself. For a total of $25.98 ($28.98 for the printed version), you can also buy a copy of the novel to go with the study guide. I just picked up a copy from the library. The e-guide is pretty nice for several reasons. First of all, you receive your product right away. There’s no waiting for the mail. Second, if you’re doing the study with only one student, you can download the student version right to your child’s computer (if he has his own) and he can do the work right in the PDF. There’s no writing required. Alternatively, you can print the guide. This is good if you want to use it with more than one child or if you don’t want your child relying on the computer for every little thing. I fall into both of the latter categories, so I chose to use a printed version of the study guide (sort of – more on that in a minute). The Tuck Everlasting guide is divided into five-chapter “chunks.” For each 5 chapters, there is a series of “paperwork” for your student to move through. These include activities such as vocabulary, comprehension questions, exploring what the author’s intentions might have been for specific words/phrases used, and comparing things the characters say to Biblical principles. And that’s just barely scratching the surface of what’s included. Additionally, concepts such as foreshadowing and similes/metaphors are discussed and there are activities for students to practice their understanding of those notions. 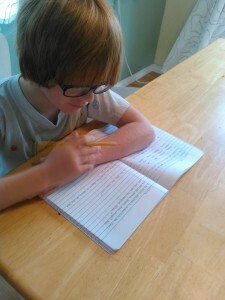 It’s no secret to regular readers that we don’t really print anything out for our homeschool. It’s not that I have a problem with doing so, but more that it’s just not convenient for me since we don’t currently have a printer at home and going to the print shop for every little thing is a pain. 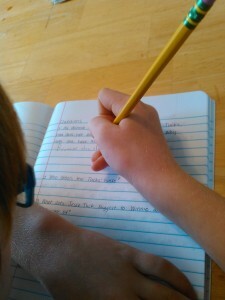 So I spent time before we were ready to dive into each of those 5-chapter chunks I mentioned before writing down all of the activities and questions in each of the boys’ Literature composition books. I did this one chunk at a time to save my sanity (and hand!). Day 1: The boys did the prereading activity, which was to do some basic research on Juan Ponce de León (we got a book from the library for this) and write a report on his life, paying particular attention to his obsession with the Fountain of Youth, which he thought was in present-day Florida. Day 3: We worked together (with me guiding rather than helping) to get through the vocabulary section. Day 4: We learned about setting and made an educated guess as to the time period that the book takes place. We also explored the author’s descriptive writing, discovering how she used several verbs rather than adjectives to describe a road. Day 5 (Week 2, day 1): With my guidance, the boys answered the comprehension questions, including some that required them to think beyond the words on the page to answer (for example, “How does the man in the yellow suit react to the sound coming from the wood? What might this indicate?”). Day 6: We learned all about foreshadowing, and the boys reread the prologue, this time pulling out specific pieces that they thought were bits of foreshadowing. We also explored what a symbol is in literature. Days 7 and 8: We worked through the “Dig Deeper” questions. These are a series of questions for each chunk that are far beyond simple comprehension and require students to both think more carefully about the story and put the novel into the context of their own lives (for example, do you have any boundaries?) and the Scriptures (what do these passages say about obedience?). Because the Tuck Everlasting study guide is written for a higher level than the Little House in the Big Woods one was (middle school versus upper elementary), it’s taking us quite a bit longer to get through. To date, we’ve read through chapter 15 and are going to get into the “Dig Deeper” portion for that chunk (chapters 11-15) early next week. The novel has a total of 25 chapters plus an epilogue, so I expect we’ll finish up the study guide around the end of this month. As I stated in my opening paragraph, Progeny Press is one of my very favorite companies. I love their study guides; it’s so nice to have a deep, rich experience studying novels rather than just reading them. That’s not to say there’s anything wrong with “just” reading, but that for a “literature class,” it’s good to have something more extensive. I love how they incorporate Christian principles into their study guides and encourage students (and teachers!) to explore the Scriptures in relation to the novels they write the guides for. Progeny Press has study guides for students of all ages, so make sure to head over to their site to find one that’s the right fit for your child(ren). I promise you won’t regret it! 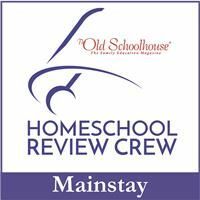 If you have students in other grade levels (from early elementary all the way up through high school) make sure to click the banner below for a selection of Schoolhouse Review Crew members and their reviews for a huge variety of Progeny Press study guides. This year’s Crew is talking about study guides for the following novels/categories: Sam the Minuteman and Miss Rumphius (early elementary); Sarah, Plain and Tall and Stone Fox (upper elementary); Tuck Everlasting and Carry On, Mr. Bowditch (middle school); and To Kill a Mockingbird and Intro to Poetry (high school). You’re sure to find something interesting!